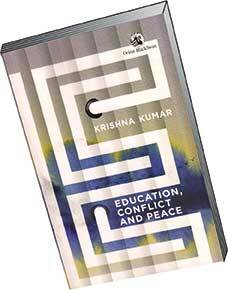 Education, Conflict and Peace by Professor Krishna Kumar is a book that will amply reward you for reading it. The author begins by reminding us that children are always exposed to conflict and violence; it is part of their lives both in an ‘intimate and broader’ sense. Children know of its presence and absorb it, but they are not allowed to look at it, both in the content of what they study and how they study. As far as their education is concerned, conflict does not exist. Dr. Krishna Kumar insists that some conflicts are embedded in the ‘system of education’ while others are part of the knowledge that is imparted through the curriculum. He then proceeds to examine each subject and tells us how its content and the way it is taught increases the level of conflict in the child’s mind, creates contradictions, and impedes understanding. He first deals with history and proceeds to tell us how in the effort to cover all of India’s history (but only till 1947) and by treating all the events in the same cursory manner, the curriculum hampers true understanding and encourages rote learning. Our effort to use history to foster citizenship and develop a spirit of nationalism is, in reality, creating a fragmented sense of national identity in the child. He says focussing on a few central events in history and then encouraging the child to take on the historian’s role (mainly by examining sources) while studying these areas, will foster critical enquiry in the child and create a more direct connect between the child and history. Two vastly different approaches to our past – what he calls – the ‘received’/consciously secular approach and the ‘rival’ approach further confuse the student. In the teaching of science also, Krishna Kumar sees two contradictory approaches to the subject. Environmental science is taught in schools to instil, in the child, the importance of conserving nature. However, in the teaching of the other sciences, the focus is on development, and in these subject areas, nature is looked upon as something to be used (and abused) in the name of progress. In this situation, the child is confused. There is no clear sense of priorities, and the fostering of a scientific temper is ignored. In the teaching of languages, he focuses the lens on the huge divide between the English medium schools and the vernacular ones, and the consequent divisive effects on our society. He traces the causes and the history behind this reality and encourages us to observe for ourselves the effects of this schism. The chapter on corporal punishment forces us to look at how teachers hitting children is still a practice in most schools. In a very interesting exercise he analyzes the historical reasons as to why this practice enjoys social sanction and why, when it occurs, parents turn a blind eye or even encourage it as a necessity. Krishna Kumar is a professor at the Central Institute of Education, Delhi University, where he teaches a course on peace education that he designed. Because he sees the critical importance of it, he describes how he encourages his students to acknowledge the conflicts in their lives, discuss them, and examine their roots and manifestations. In the process, they gain some understanding of these conflicts and learn how to deal with them. On reading the book, educationists will develop a deep understanding of the historical and pedagogical factors that underpin our curriculum and educational practices, because Krishna Kumar has a wide ranging knowledge of different kinds of schools, children, and the system of Indian education. He encourages us to look critically at the curricula, syllabi, and also at our methods of teaching. He writes lucidly, using striking examples. His analytical approach hits at the very roots of the problem and as he goes along, he counters arguments he anticipates. Whether for teachers, parents, or those interested in what and how Indian children are taught, the book reaffirms that it is important to go beyond the textbook, encourage curiosity in children, learn to anticipate their responses, respect their efforts to make meaning of whatever they are taught, and above all to recognize that children have a deep desire to learn and need to be trusted to do so. Psychologists tell us that the child’s innate desire to ‘look for order and coherence gathers strength from the knowledge of conflict.’ In this book, the author starts from the premise that acknowledging conflict is absolutely essential to our understanding of it. Only then will we learn how to deal with it, and most importantly, learn to live together peacefully. A direct engagement with conflict and schools encouraging this approach would lead to a greater competence in dealing with it. Undoubtedly, this is a life-skill which is of critical importance in the world children are living in today. The author is heading The Peepal Grove School, Chittoor, Andhra Pradesh. She can be reached at sunandaali5@gmail.com.